Paranoia is loosely based on the novel by Joseph Finder. After reading the novel I wondered which direction Robert Luketic would take with his interpretation. The direction was very thrilling and on the edge exciting with twist and turns to the plot. In today’s world everyone is connected with phones, tablets and other gadgets and it makes you think, could something like this happen to me? Is someone watching? My job gave me this electronic leash, are they tracking me? Does it make you wonder? Are you a little paranoid like I am right now? With all of the Social Media check in’s do you ever wonder if someone could be tracking your every move? There’s an app for everything and possibly one that is tracking this review. With Liam Hemsworth in the leading role as Adam Cassidy an entry level computer tech employee that is turned into a corporate spy by an egotistical Nicolas Wyatt played by Gary Oldman. Adam is brought into a world he could only dream about and his life is controlled and games are played from every angle, even with Emma Jennings played by Amber Heard who is Adams love interest. Richard Dreyfuss plays Adams father whose character is very lovable. Harrison Ford plays the mysterious Jock Goddard whose unsuspecting character keeps you on the edge trying to figure out what the next turn of the plot will bring. I enjoyed the movie but it does have me wondering, what would you do if you found out someone was tracking your every move? The consensus in the theater was that this was a great movie and worth seeing again. 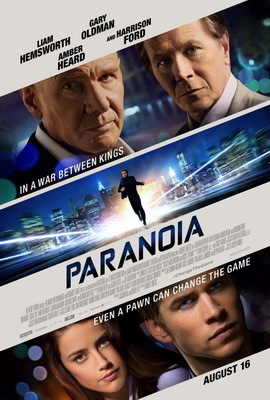 Comments for Paranoia : Review are now closed.